Sussex Community NHS Trust has been trialling a suicide risk assessment tool. Andrea Richardson and Nessie Shia describe the system and look at the findings. Mental ill health is one of the main causes of sickness absence in the UK and is a high priority in terms of improving client outcomes and reducing lost working days (World Health Organisation (WHO), 2006). The Government’s mental health strategy for England (Department of Health, 2011) emphasised that OH nurses, school nurses, health visitors and practice nurses will be expected to play a much greater role in identifying those at risk of mental health problems. Nurses play a key role in the care of people with mental disorders and need to be recognised and incorporated into the overall plans for mental health promotion in all countries (WHO, 2006). It remains a challenge for all health professionals to minimise suicide risk when an individual presents with a mental health problem. An audit project to promote best practice in mental health risk assessment in an OH workplace found that the use of a suicide risk assessment tool is valuable in an OH practice setting, providing a robust assessment framework that underpins clinical decision making and encourages clear documentation. Nurses need to be able to provide mental health care in the community, as community services should be the most easily accessible form of care. Community nurses with appropriate education and training can perform a much wider variety of functions within mental health services than they are currently allotted (Shia, 2009). The scale and economic cost of work-related ill health ideally places community nurses in the central role of promoting mental health and wellbeing for all in the workplace, in both private and public organisations, and in communities (Waddell and Burton, 2004). The specialist community public health nurse (SCPHN) role is a new one, and the contribution to mental health promotion is crucial in reducing health inequalities and unmet needs (Nursing and Midwifery Council (NMC), 2004). The role of SCPHNs emphasises partnership working that cuts across disciplinary, professional and organisational boundaries (Royal College of Nursing (RCN), 2007). The recent improved level of integration between primary and secondary care and a shifting of roles for healthcare professionals are seen to be optimising the management of depression in primary care settings (Shia and Bankole, 2008). SCPHN roles ought to be expanded to incorporate assessment, evidence-based care and follow-up using psychosocial and pharmacological interventions. The role should be fully involved in the development of policy, audit, care plans, legislation and service programmes. Sussex Community NHS Trust’s occupational health service is nurse led. 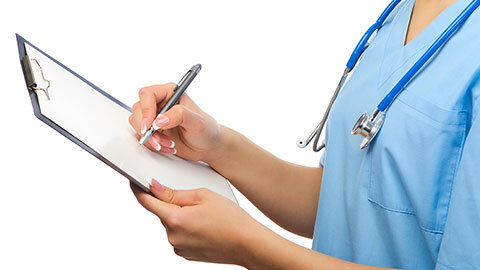 Based in the South of England, it provides an OH service primarily to healthcare employers. Proactive approaches to mental wellbeing for staff are encouraged by both the OH provider and its customers; these include “stress” risk assessment, regular supervision, an “open door” policy and workshops on mental health and work. A departmental review of clinical notes formed the basis for a suicide assessment tool (SAT) to be introduced. Samples of 20 clinical records of clients known to have a diagnosis of depression and to have attended an appointment with an occupational health practitioner (OHP) in the previous three months were selected. All 20 clinical notes had stated a diagnosis of depression previously made by the clients’ GP. All had a completed copy of the Prime-MD Patient Health Questionnaire (PHQ-9) validated for use in primary and secondary care. This tool is used to assess the scale of depressive illness and to track symptoms over a period of time, enabling evaluation of treatments (Feldman and Christensen, 2008). Duffy et al (2008) suggest that the PHQ-9 is achievable even in practices with limited resources; mostly this is attributed to its brevity, ease of interpretation and the dual capability of assessing DSM-IV criteria and symptom severity. Of the selected 20 clinical notes, 12 clients had indicated suicidal thoughts in the past two weeks. However, only eight practitioners had documented further questioning of this. It is possible that professionals may have assessed this but did not document it. Reflecting on clinical practice and making changes according to need are fundamental to continue improvement and quality care. This audit acted as a benchmark that a more consistent approach was needed in assessment, signposting and documentation. The SAT was added on the reverse of the PHQ-9 – the purpose being that if the client answers positively to question nine of the PHQ-9, “Thoughts that you would be better off dead, or hurting yourself in some way,” then the OHP continues with essential questioning to assess any intent, and the management algorithm gives clear guidance on how to signpost the client appropriately (see table 1). This strategy is in line with the National Institute for Health and Care Excellence (NICE) stepped-care model. The focus of the intervention is the questions that the OHP asks and the nature of the intervention is how the client is advised. The suicide risk assessment tool, based on a community suicide risk tool, is short and simple. It aims to identify suicide intent and psychosis; people experiencing psychosis are at high risk of suicide (Power and McGowan, 2011). Previous suicide attempts or threats of suicide should also be a consideration by the OHP and are added to the tool as a prompt to explore this further; as 10% to 12% of those who threaten or attempt suicide go on to achieve this within five to 10 years (Runeson, 2001). The previous mental health history of a client may not be known; often this is because they have not divulged this information because of fear of stigma. Mental ill health is entrenched in stigma, and this is possibly the greatest obstacle that affects individuals in seeking help or reaching personal goals (Grove, 2009). Therefore, while asking questions about suicide is often seen as difficult and perhaps even uncomfortable, it is usually a huge relief to the client to share their inner thoughts, of which many are feeling shameful. McAuliffe and Perry (2007) found that blunt questioning regarding suicide could minimise symptoms being reported, so caring questioning should be promoted. The SAT should be considered as a tool to guide good communication in difficult emotive circumstances, and while it is reactive in terms of mental ill health, it is proactive in suicide prevention. Documentation always needs to be clear, concise, accurate and timely. Record keeping is often the subject of professional disciplinary hearings and is an essential element to good nursing practice in all nursing disciplines. Record keeping relies on the professional’s judgement and documentation is a reflection of the standard of care given – this is fundamental in any clinical practice. The SAT promotes the accurate recording of the clinician’s assessment and provides an appropriate action guide. This assists the OHP in judging and managing the identified risk. The initial risk assessment can be used as a benchmark for future assessments, which also promotes consistency and continuity of care. Shea (2002) promotes this practice, as documentation is not only a legal obligation, but improves client care and the clinician’s recall from previous assessments. The form can be completed either in writing or electronically, and ensuring that it is filed in the client’s OH notes completes the documentation process. Within a three-month period from the introduction of the combined PHQ-9 and SAT tool, all 10 OHPs were including the joint PHQ-9 and SAT form in clients’ notes. After a six-month period, an OHP evaluation of the tool was conducted by questionnaire. All 10 OHPs have diverse nursing experience in both acute care and community care services. Seven have an OH qualification and three have general nurse qualifications. All had a minimum of five years’ OH experience. The questionnaire asked if the OHP had found the SAT useful in practice and if it had increased their awareness of clients who presented with depression and a suicide risk. It also asked if the OHP felt the tool had improved the way they signposted clients and if they felt more confident in their assessment of clients presenting with suicidal ideation. Finally, they had to consider if they had improved their documentation regarding the risk assessment of clients since using the SAT. In box 1, each of the five charts reflects the question that the OHPs were asked and demonstrates their opinion of the tool in their own practice. Each practitioner was asked to answer “yes” or “no” to the five questions, with the option of commenting about their response. Some 20% of the OHPs had not needed to use the SAT because their clients who were asked to complete the PHQ-9 had not answered positively to thoughts of suicide or self-harm. However, the majority of OHPs found the tool to be effective and beneficial in practice. Looking at the charts in sequence, the first chart relates to the question: “Have you found the tool useful in practice?” Of the 80% who responded, all found the tool useful and some commented that it made asking specific questions about suicide easier to address and showed professionalism. The next chart shows that 60% of practitioners felt they were more aware of clients who had a suicide risk through using the tool; this was thought to be as a result of improved and appropriate questioning. The chart “Confidence in assessment” refers to a question about whether or not the practitioner felt more confident in their assessment of clients who presented with suicidal ideation since they had used the tool. The response to this question showed that 80% of practitioners felt more confident in their assessment. Some of the comments made by the OHPs included that the SAT provided a “clear clinical framework”, making them feel more confident in decision making. This is a key point as often the OHPs are working autonomously in clinics in a variety of situations where they need to make good clinical decisions in a timely manner. Giving advice and signposting are a main function of the OHP role. Practitioners were asked if the tool had improved the way they had signposted their clients presenting with suicide risk. Some 70% of the practitioners stated that they felt their signposting had improved. It was commented on that the inclusion of management guidance in the tool had been the main reason for this, together with improved client assessment because of specific questioning. Other comments were that the tool encouraged partnership working with primary healthcare teams. Partnership working to protect public health and wellbeing from specific risks is one of the SCPHN role’s proficiency standards (NMC, 2004) and working collaboratively with other specialists is likely to provide better client outcomes (Black, 2008). 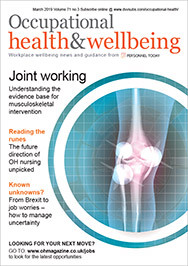 From the positive results, the OHPs in this unit have seen that through working with other health professionals, for various reasons, joint working is endorsed as essential to employee health and wellbeing. The final chart in box 1 asked practitioners directly if their documentation had improved because of using the tool. Some 60% felt that their documentation had got better in relation to suicide risk assessment. The reasons given were that the form was quick and easy to use, whereas documenting in the clinical notes often takes longer, and because of the nature of assessment sometimes gaps in information can occur. Being able to prevent all suicides is unrealistic, but clients need to be signposted and advised appropriately to get the best care. Early intervention services studies have shown that suicide rates could be significantly reduced (McGorry et al, 1998; Power and Robinson, 2009; Power, 2010). Training in suicide risk assessment has been highlighted as an area that requires attention (Gask et al, 2006). While OHPs and nurses in primary care roles may not be mental health specialists, they play an important role in ensuring clients get the best possible care to achieve the best outcomes. This is essential as mental ill health is linked with co-morbidity, recovery and social inclusion. Granello (2010) identifies that assessing suicide risk can be one of the most challenging aspects of a professional’s role. This study has demonstrated that having a tool to guide assessment of this risk and clear guidance on signposting clients has made this process easier for the majority of practitioners. Other OH services and community-based nursing teams may find such a tool enhances existing practice. Signposting options may need to be altered in line with the appropriate control measures to prevent suicide within their service areas. Mental ill health as a public health issue is one of the main causes of sickness absence in the UK and is a high priority in terms of improving client outcomes and reducing lost working days (WHO 2006). It remains a challenge for all health professionals to minimise suicide risk when an individual presents with a mental health problem. The use of a suicide risk assessment tool has also been shown to be valuable in an OH practice setting, providing a robust assessment framework that underpins clinical decision making and encourages clear documentation. Documentation is a key issue that has been examined in the context of suicide risk assessment and has been shown to lack detail or give the clarity that demonstrates professional accountability. As an important element of high-quality healthcare, good documentation must always be a professional goal for all nursing disciplines. SCPHNs are ideally placed to promote public mental health and wellbeing in the workplace and the community. Andrea Richardson is a specialist practitioner in OH at Brighton General Hospital and Nessie Shia is a lecturer in mental health nursing and APEL co-ordinator at Brunel University’s School of Health Sciences and Social Care. Black C (2008). “Working for a healthier tomorrow”. The Stationery Office; London. Department of Health (2010 b). “Essence of care”. Crown Copyright. TSO; Norwich. Department of Health (2011). “No health without mental health: a cross-government mental health outcomes strategy for people of all ages”. Crown Copyright. DH; London. Department of Health (2012). “Consultation on preventing suicide in England: a cross-government outcomes strategy to save lives”. Crown Copyright. DH. London. Duffy FF, Chung H, Trivedi M et al (2008). “Systematic use of patient-rated depression severity monitoring: is it helpful and feasible in clinical psychiatry?”. Psychiatric services; vol.59, issue 10, pp.1,148-1,154. Granello DH (2010). “The process of suicide risk assessment. Twelve core principles”. Journal of Counselling & Development; vol.88, issue 3, pp.363-371. Grove B (2009). “Mental health in the workplace”. Occupational Health; vol.61, issue 2, p.36. McAuliffe N, Perry L (2007). “Making it safer: a health centre’s strategy for suicide prevention”. The Psychiatric Quarterly; vol.78, issue 4, pp.295-307. McGorry PJ, Henry L, Power P (1998). “Suicide in early psychosis: could early intervention work?” In: Kosky R, Eshkevari H (Eds). Suicide Prevention: The Global Context; pp.103-110. New York; Plenum Press. National Institute for Health and Care Excellence (2004). “Depression: management of depression in primary and secondary care. Clinical guideline 23”. National Institute for Health and Care Excellence (2009). “Depression: the treatment and management of depression in adults”. Nursing and Midwifery Council (2004). “Standards of proficiency for specialist community public health nurses”. Nursing and Midwifery Council (2009). “Record keeping: guidance for nurses and midwives”. London. Power P, Robinson J (2009). “Suicide prevention in first-episode psychosis”. In: McGorry P, Jackson H (eds). The Recognition and Management of Early Psychosis: A Preventative Approach. Cambridge University Press. Power P (2010). “Suicide prevention in early psychosis”. In: French P, Smith J, Shiers D et al. (eds) (2010). Promoting Recovery in Early Psychosis: A Practice Manual. London; Wiley Blackwell. Power P, McGowan S (2011).”Suicide risk management in early intervention”. The National Mental Health Development Unit. Royal College of Nursing (2007). “Nurses as partners in delivering public health”. Runeson B (2001). “Para suicides without follow-up”. Nordic Journal of Psychiatry; vol.55, issue 5, pp.319-323. Shea S (2002). The Practical Art of Suicide Assessment: A Guide for Mental Health Professionals and Substance Abuse Counsellors. Hoboken NJ; Wiley. Shia N, Bankole V (2008). “The evaluation of interdisciplinary learning initiative in managing depression”. Journal of Practice Teaching & Learning; vol.8, issue 1, pp.70-81. Shia N (2009). “The role of community nurses in the management of depression”. Better Practice, Nurse Prescribing; vol.7, issue 12, pp.548-554. Waddell G, Burton AK (2004). “Concepts of rehabilitation for the management of common health problems”. The Stationery Office; London. World Health Organisation (2006). “Preventing suicide: a resource at work“. 1. Have you ever thought about how you would harm yourself? 2. Do you have plans in place to harm yourself? 3. Do you think you can withstand the urge to harm yourself? 4. Do you hear voices?